Last week billionaire and notorious "birther" Donald Trump claimed that he had a "bombshell" that would change the election: he announced that if President Obama would provide him with copies of his college and passport records that he would write a check for $5 million to the charity of Obama's choice. First of all, I have to tell you there's tremendous momentum. When I originally did it the first little while, people didn't quite get it. And there was a little bit of a backlash, there was some people who didn't like it, but there were a lot of people that did. Now there's unbelievable momentum. For many of us the "birther" craze has seemed like nothing more than a disturbing sign of the eccentricities that govern extremist, right-wing, conspiracy thinking, but Trump's media stunt is clearly meant to affect the election. This latest move is not just a sign of party eccentricities; it is also a sign of the way that the wealthy are trying to control the election and run the country. The joke may be a crude one, but it would be fair to say that Trump asked for it. And you gotta love Colbert's willingness to put his balls to public service and expose the folly of Trump's disturbing challenge. Colbert's over-the-top mockery of Trump does more than reveal the ego of the challenge; it also exposes the ridiculous way that Trump is trying to use his wealth to mock our president. Colbert responded by using his own celebrity and satirical wit to expose one of the key problems behind Trump's stunt: Trump makes his offer seem like a gesture at the service of the U.S. public and in support of transparency in the electoral process, when in fact it is insulting, distracting, and responsible for dividing our nation over issues that have long been resolved. Republicans like Trump would have us believe that his offer is just about getting at the truth, and yet his party has been at the forefront of spin and falsehoods this election cycle. 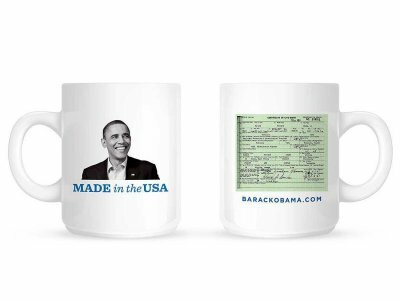 Democrats can drink their coffee out of mugs that reproduce Obama's birth certificate and read "Made in the USA." If the Romney-Ryan ticket wins, do you think Republicans will make mugs with Romney's tax returns and Ryan's marathon times? Probably not. We have no way of knowing whether Trump's stunt will, in fact, succeed in discrediting a president that has already proven his legitimate right to lead the nation, but we can thank Colbert and his balls for making sure that we are not only thinking about what is coming out of Trump's mouth, we also have an image of something going into it.